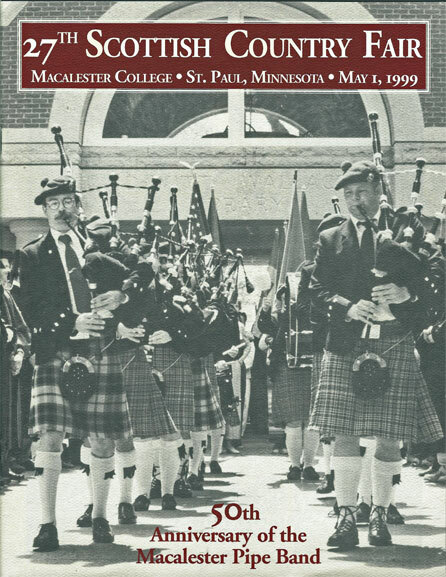 I attended my first Highland Games at Macalester College in St. Paul. I loved visiting the cultural tents. I loved watching the dancing and the heavy athletic events. The highlight, though, came when the massed pipe bands took the field. The music and energy seemed to pulse deep inside me. I got a lump in my throat, and had to blink back tears. As I scrabbled to find a tissue, I saw that others in the viewing stands had been affected the same way. 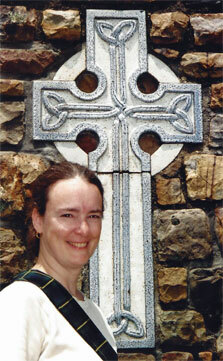 I’ve always been interested in Scottish heritage, history, and culture. It may be because my ancestry on my maternal grandfather’s side is partly Scottish. The first Scottish person on my particular branch of the family tree came to North America a long time ago—so long that we’re not even sure when—so the Scottish part of my makeup is fairly small. Still, something in me responds to all things Scottish. The sash I’m wearing shows the Clan Johnston tartan. One possible reason for my feelings is something called genetic memory, or ancestral memory. People who believe in ancestral memory think that impressions from the past might be passed down to us. Our genes contain information that determines whether we have blue eyes, or are shorter or taller than average. Perhaps our genes also contain memories from our ancestors. Want an example? Most people love to stare at fires. We enjoy campfires. We like indoor fireplaces too, even if we have central heat. Some people believe that our fascination with fires goes back to the time, centuries ago, when fire represented safety, heat, cooked food, camaraderie—everything good. 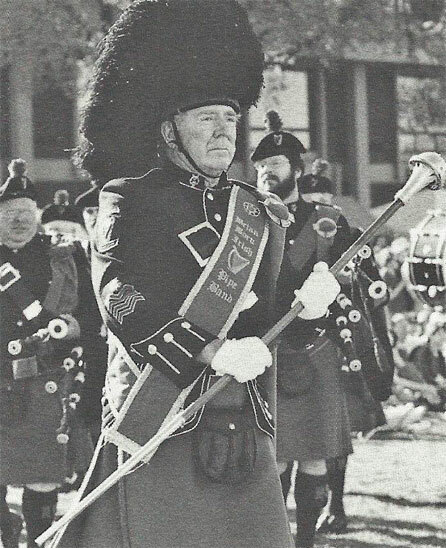 By the time I experienced my first massed pipe band concert, I’d done a lot of research about Scottish history. My historical mystery Betrayal at Cross Creek is about a Scottish immigrant girl during the American Revolution. 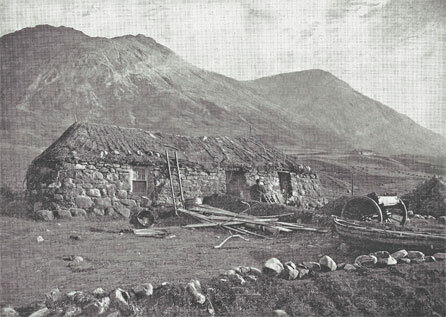 This old print shows a crofter’s hut on the Isle of Skye, where my character Elspeth came from in Betrayal at Cross Creek. Might memories of such places be locked in the DNA of such immigrants’ descendants over two hundred years later? I was also working on a video series for public television called Cultural Horizons. Production of this instructional series immersed me in the topic—what culture is, what choices we make about our own identity, how elements of our heritage are passed from generation to generation, our attitudes and beliefs. With all these ideas swirling in my head, I decided to write a young adult novel that explored such themes. 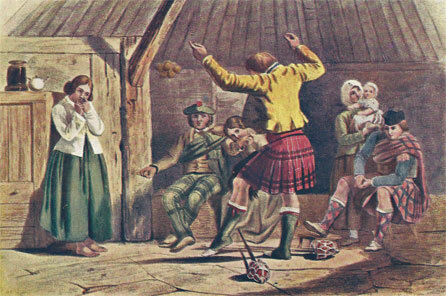 How did displays of Scottish heritage change over the generations? 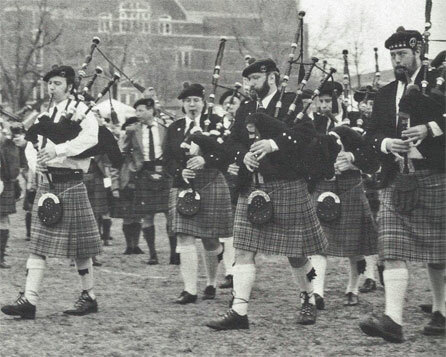 What decisions do Scottish-Americans make about cultural identity? 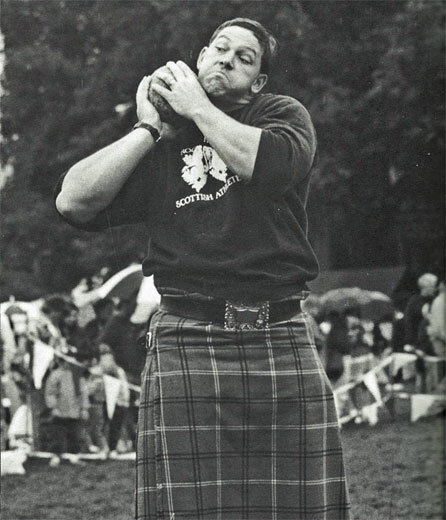 Might some people be drawn to Highland Games because an element of ancestral memory is quivering in their genes? This print shows a returning warrior doing a sword dance. From these questions, my character Tanya Zeshonski was born. She started her fictional life in Green Bay, Wisconsin, which happens to be where Cultural Horizons was produced. The story, though, takes place in North Carolina, which has a large population of Scottish-Americans. Although Tanya is partly of Scottish descent, she initially has zero interest in all things Scottish. She’s focused on making documentaries, and dealing with the aftermath of her parents’ divorce. 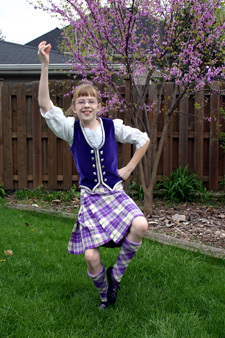 But she gets talked into participating in a dance competition at a local Highland Games. Participants in the Highland Dance competition at Grandfather Mountain Highland Games in North Carolina. 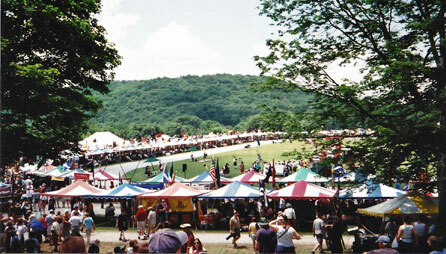 At Grandfather Mountain, cultural tents circle the field. Music venues are tucked into the trees. 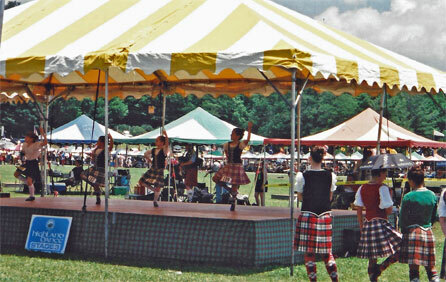 Athletes, dancers, and pipers compete in the center area. Tanya arrives at the event determined to show that the rampant displays of ethnic pride are overblown and perpetuate myths. But during that momentous Highland Games weekend…well, I’ll let you discover what happens for yourself. 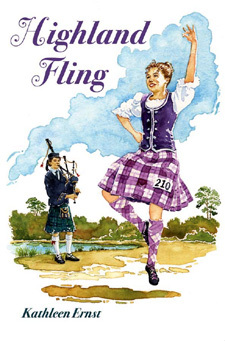 Although Highland Fling focuses on Scottish culture, the ideas Tanya wrestles with have meaning for everyone. We all make choices about what parts of our cultural heritage we want to ignore or to celebrate. We all can choose how we wish to define our cultural identity. Isn’t that great? PS: After the book was published, I was delighted to receive this picture from a young dancer. She looks just like Tanya on the cover! I've worn many bonnets over the years: writer, reader, historical interpreter, curator, reenactor, naturalist, educator. I've never had a job I didn't love. How lucky is that? Receive her quarterly newsletter, and get event alerts.